Dataiku is the a productive development platform for data professionals. This all-in-one tool integrates all the capabilities required to build end-to-end highly specific services that turn raw data into business impacting predictions quickly. "Fully collaborative, high ROI and productivity-oriented data science platform "
Many succesful applications for Oil and Gas industry, fin-tech, e-commerce, retail, automotive, marketing, tourism, etc. "It help me as a data scientist to explore multiple fields on a single platform"
It's a single platform to compute possibly everything and very user friendly. What Machine Learning solution do you use? The setup process was really easy and clear. I was able to start using the functions very quickly. I like the User Interface and the ease of using the controls. I would definitely recommend this software to anyone looking for full fledged data science abilities. I just wish that there should be a FREE light version. Use your own data to create, train, and deploy machine learning and deep learning models. Leverage an automated, collaborative workflow to grow intelligent business applications easily and with more confidence. Scikit-learn is a software machine learning library for the Python programming language that has a various classification, regression and clustering algorithms including support vector machines, random forests, gradient boosting, k-means and DBSCAN, and is designed to interoperate with the Python numerical and scientific libraries NumPy and SciPy. Recommendations API is a tool that helps customer discover items in users catalog, customer activity in a user's digital store is used to recommend items and to improve conversion in digital store. machine learning support vector machine (SVMs), and support vector regression (SVRs) are supervised learning models with associated learning algorithms that analyze data and recognize patterns, used for classification and regression analysis. Dialogflow is an end-to-end development suite for building conversational interfaces for websites, mobile applications, popular messaging platforms, and IoT devices. 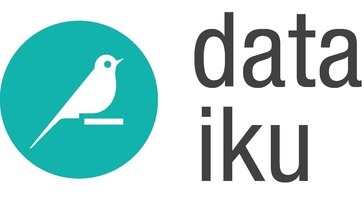 * We monitor all Dataiku reviews to prevent fraudulent reviews and keep review quality high. We do not post reviews by company employees or direct competitors. Validated reviews require the user to submit a screenshot of the product containing their user ID, in order to verify a user is an actual user of the product. Hi there! Are you looking to implement a solution like Dataiku?